Success stories are a highly effective marketing tool. They lend credibility to your firm’s technological expertise in a format that prospects can easily relate to and understand. A well-written story delivers compelling evidence of your ability to provide ERP, CRM, HR, and other technology solutions that help your prospects become more efficient, profitable and competitive … which may ultimately help you get the deal closed!! But developing an effective success story is as much an art as it is a science. At Juice Marketing, we’ve developed several best practices that enable us to deliver success stories to our clients that are compelling and resonate with their prospects. 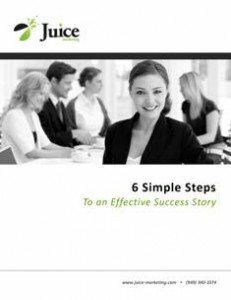 So let’s take a look at 6 critical elements of an effective success story. By now, most small businesses recognize that Content is King. If you don’t, take a quick look at 5 Reasons You Need Great Content. That said, most Sage and Microsoft VARs have trouble coming up enough content to consistently stay top of mind with customers and prospects. That’s why we thought we’d share the results of a recent survey conducted by Marketing Sherpa that identifies the most effective tactics for developing marketing content.